I'll be happy with 3 figures after that, could be a painful one. This was not a good decision. Yes a loss of 30 points. Not gonna lie, I'm pretty annoyed about the DNFs for this race. 121 points. Could have been so much more, with 3 retirements dropping out of pretty much the positions I had them in. I estimate that with Ricciardo holding onto 2nd and Sainz and Perez both finishing somewhere ahead of Leclerc, I could be looking at about 212 points. We have a winner (I think)! 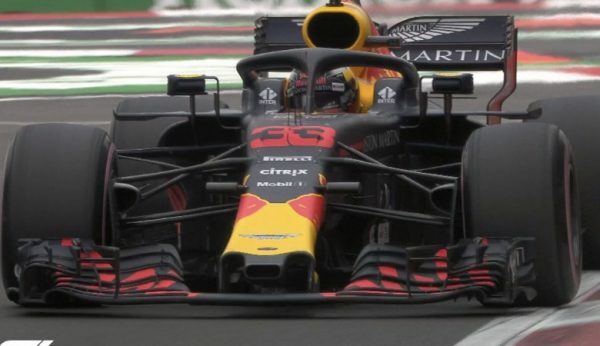 The start of the race saw pole man Ricciardo passed by fellow front row starter Verstappen and Hamilton with Verstappen managing to hold off Hamilton into the first corner followed by Ricciardo and Vettel. It wasn't long into the stint before the Mercedes started to struggle with the front tyres graining and both Hamilton and Bottas pitted for the hardest super soft tyres, this triggered the Red Bull drivers Verstappen and Ricciardo to also pit onto the same tyres whilst the Ferrari drivers Vettel and Raikkonen stayed out a bit longer. This put Vettel into the lead from Verstappen and Raikkonen with both Hamilton and then Ricciardo then needing to pass Raikkonen which after a few laps they did then both Ferrari drivers also pitted for the super soft tyres. Even with the hardest tyres on it didn't take the Mercedes drivers long to once again struggle with front tyre graining and was passed by both Vettel and Ricciardo, Vettel having passed Ricciardo earlier after he got held up in traffic. Hamilton locked up badly and went off the track when Ricciardo passed him which signalled anothe change of tyres for Hamilton. Bottas did exactly the same a lap later allowing Raikkonen past for 5th place and he also immediately came in for another tyre change. The running order was now Verstappen leading from Vettel who was charging hard behind him, then Ricciardo, Raikkonen, Hamilton and Bottas. Vettel pitted for more tyres and Verstappen immediately pitted in response coming back out still in the lead but Vettel was now behind Ricciardo. Despite Vettel's fresh tyres Ricciardo had little trouble in keeping Vettel behind him but Ricciardo then had to pull off the track with a hydraulic problem and the race finished with Verstappen winning from Vettel, Raikkonen, Hamilton and Bottas. In third place with 141 points and receiving the "Reliant Raikkonen Trophy"
In second place with 144 points and receiving the "Valiant Vettel Trophy"
In first place with 146 points and receiving the "Victorious Verstappen Trophy"
Jenson and I both shot ourselves in the foot by trying that trick this weekend. Has anyone ever successfully made the strategy work? I think unless your initial picks are just badly, fundamentally wrong, the basic randomness of most finishes will make it a bad strategy. What I found when I was trying it is that in most races DNFs, botched pitstops, etc. will mean that even if you correctly pick the 10 cars that should finish in the points, you're almost certainly going to miss some anyway. In this race for example there really wasn't any change I could have made to improve my picks, even with all the data - unless I knew that Ricciardo, Sainz and Perez were going to DNF, I would always lose points to someone who had the competitive order less correct. That's just the nature of the game. That very strategy got me a podium in Monaco last year, but the two times I've tried it since, it has resulted in a loss of points. But you need two things to go your way if you do it. Firstly, as Exediron says, your initial picks have to be miles off. Secondly, you have to be lucky. At the start of the race I was actually quite confident: outside the obvious top six choices, Renault looked to be 'best of the rest' and Force India's quali strategy should've put them into a good position to take the remaining two places. Of course, it took all of twenty seconds before Ocon picked up damage, but even then until the point Sainz retired, my top nine featured all the drivers in the top nine. But then Sainz retired, followed by Perez and Ricciardo, and it just becomes a bad prediction regardless of whether it was made before FP1 or a little later in the weekend! It's definitely a strategy that can work, and given my position in the championship (i.e. nowhere) it was worth losing 18 points for the potential of a much better result. Russia really ruined my season finishing bottom of the pile and 90 points from the winner. Managed two podiums since then and might just have an outside shot of finishing in the top 3. 4 retirees in the race. All 4 in my top 10. Can anyone else say that? I may start a new game, where you have to pick those who don't finish, get penalties or are disqualified. I should win by a mile! Regarding tactical penalties it's something I want to discuss for next season, the spirit of the game is to make predictions before any of the cars take to the circuit, the skill if you like is in that and not watching the cars on the track and seeing which ones are faster. The penalty system as I see it is for people who forget to submit entries on time and I would say the penalties as such are not that harsh, in some competitions if you are late you are out simple as that. Because the penalties are not that harsh this does give a lot of scope for people to change their predictions if they are really bad, that's not really good and something I don't really like, that's not really the game. If you look at the penalty system it's 15 points for after FP1, an extra 3 points for after FP2, and then another extra 7 points for after FP3, it doesn't reflect the extra knowledge gained the more practice sessions you watch. FP3 - 25 points + 18 points + 15 points = 58 points. FP3 - 35. It doesnt have to be restricted to multiples of 25,18,15 etc! Not me, I didn't have Alonso. But I'm not sure he would have finished top 10 with RIC, PER and SAI finishing. Thanks for the reply, I see your point about the points not being ramped up like that to resemble the current points system, that just nicely suited the present system. Likewise though I don't really see why the penalty points should be ramped down, 15 points for missing FP1 then basically just 3 points for missing FP2. 15 points I see as perfectly acceptable for missing FP1 but that should also be consistent for missing FP2 and FP3. Tactical late entries is something I've been monitoring and with the current penalty point system at times there are definite advantages to doing it, in Mexico I think it was just bad luck that saw it not pay off and it was only a few rounds ago that 4 of the top 6 entries were late entries which I found a bit disconcerting. There was a discussion about 11 months ago with some concerned that the penalty point system was too soft and I kind of thought there might have been some comment about the late entries dominating that one round. I'm hoping for more feed back but experience tells me I will decide to change it then I will get loads of feed back. I thought the penalties were too soft to dissuade people from trying it, but it turns out the actual dissuasion is that you usually tank your score by doing it! Do you have numbers on that? How often do those taking a penalty appear in the top 10? The feeling I've been getting is that those taking penalties do no better than if they hadn't, and may end up being worse off. Yeah, I'd like to know how many times people have taken tactical penalties (not just those with late entries) and what the average gain/loss has been. As from my perspective I've done it three times and lost points twice, and would honestly expect to lose points if I did it again. Fair enough I personally think now that the penalties are a bit soft for what can be gained in certain situations like when the original picks are really bad as witnessed by practice times. However if the general consensus is too leave things as they are then I can only go along with that. I agree with you. It's right on the border for me. Could go slightly stiffer on the penalties but happy to leave it as is. I think the important thing is that there's no repeatability of getting a good score by doing it. I'm okay with someone being able to save themselves from getting a 60 score by taking a penalty and getting a 100 instead; in this competition a single really horrible score can doom you, so I don't mind someone being able to bail out of it. So far as I'm aware, Jenson's win in Monaco was the only time someone has actually won a round with a strategic penalty, and there was a fair dose of pure luck involved in that. On the other hand, if this competition is expressly intended as predictive only with no benefit of information, you could always bar any entry made after FP1 starts. I know people leave it really late now, but I have to believe they'd do less of that if they knew it was impossible to file a late entry. I think you need to decide what the penalties are for. Earlier you seemed to say that they were for late entries, and that tactical changes to existing entries arent in the spirit of the game. If this is so then just ban any changes to existing entries. So after FP1 starts only new entries are allowed. If it's more about finding a suitable level for the penalties to punish tactical changes whilst still allowing them then we can bandy figures around forever. Maybe in the end you'll need to take an executive decision! That's nice to know. Maybe I'm not the only one feeling like Ricciardo at the moment! I run the competition but I don't own the competition as such, I took it over from someone else. Without the regular players there would be no competition so I'm not going to change anything without solid backing. My 5 cents are don't fix it if it aint broken. Coming back again to your post again that's a good idea to stop changes to selections after FP1 has started so people don't get 2 bites of the cherry as such, but as Covalent as said if people don't see a problem then why change anything. For my own part I was just voicing my own concerns that the competition should not have an unfair balance towards being reactive as opposed to being predictive. Personally I think allowing adjustments post FP1 does add something to the game. Given that people seldom seem to rate their changes as successful when they do risk it, maybe the penalties are about right or even a shade high? It depends if you want to encourage adjustments, discourage them, or find a balance to make it interesting. I'm going to suggest making the penalties 12, 18 and 25. That way there is an incentive to make a change after FP1 but before FP2, which there isn't currently.